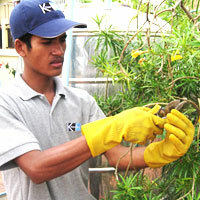 Atalian Cambodia - Technical maintenance services for your business. ATALIAN Global Services Cambodia technical maintenance unit is capable of managing the maintenance of any type of technical installation. We work closely with you to create a solution that is right for your business, with the versatility and technical expertise of our highly experienced team of mobile and site-based engineers, delivering all your building maintenance needs. Facility engineering: managing technical installations, Managing sub-contracted services. Technical maintenance: HVAC, high and low voltage, management of fluid networks, Managing security equipment for goods and people. All types of technical works: Air conditioning, Heating, Plumbing, ventilation, gas.